When the words "Purple" and "Spring" come to my mind, I can't help but think of those beautiful crocuses announcing the arrival of spring with such cheerfulness. 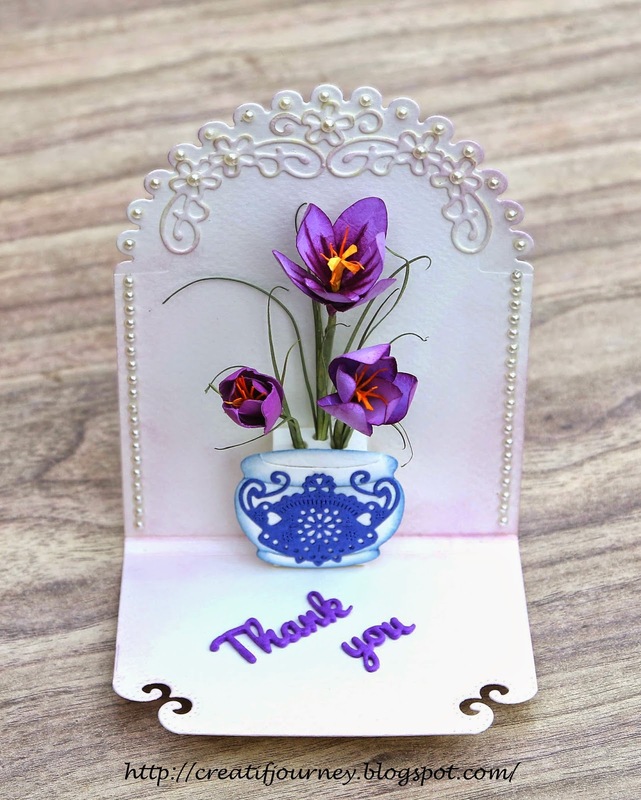 A pop-up card with a few crocuses blooming in a white and blue porcelain pot. The card when it is folded. (Recycling the beautiful leftover die cut out). Absolutely GORGEOUS creation! I totally agree ... I enjoyed my crocus at Easter and now the daffodils. I just love when the snow is gone and all the spring flowers start to appear ... lifts the spirits for sure!! Thanks so much for playing in our ‘MAY FLOWERS’ challenge at Dies R Us! Please come back again soon! I saw your card over on CARD MAKING TIPS and had to come over here to see how you made it! It's just adorable, and I may have to give it a try soon! Thanks for sharing your technique! Is there a tutorial for this type card somewhere? It looks a little tricky. Did you make your flowers? Is there a tutorial for those? I love the colors and beautiful elegant design. Beautifully done. 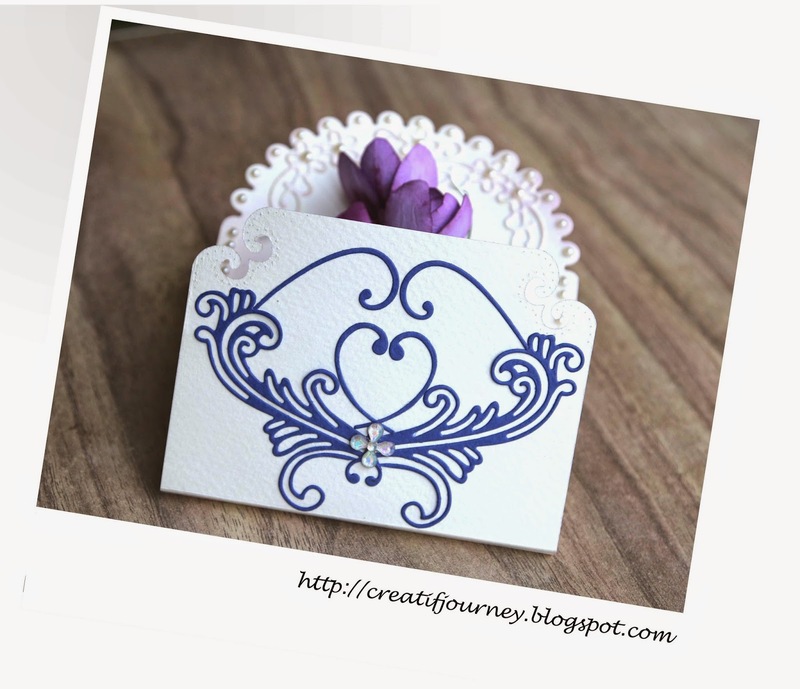 Loving your elegant card and beautiful design! The lace corner deco's really compliment that beautiful flowers! Thanks for joining the Cheery Lynn Designs challenge. Good luck! Absolutely fantastic card! The flowers look almost real and I LOVE that blue pot you put them in! Looks so much like the beautiful glazed pots I love! I'm so glad you could join us this week for the May Flowers challenge at Dies R Us! What an absolutely GORGEOUS card! 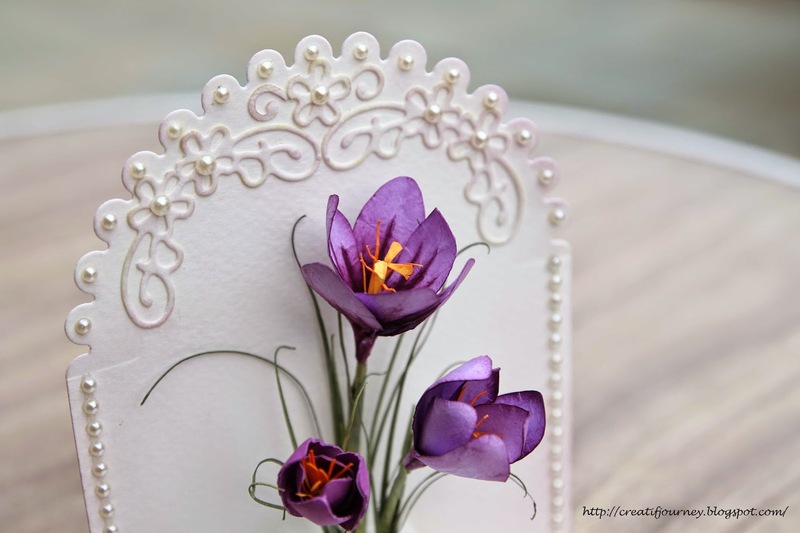 Love the crocuses, and the beautiful recycled die cut! Thanks for joining us at Die Cut Diva's Garden challenge! Beautiful card! The flowers are so lifelike and the colors are amazing! Thanks for doing us over at 613 Avenue Create this week! Wow, your flower is amazing and a fabulous card design. Good luck and thanks for joining in on the fun at Cheery Lynn Designs challenge. Wow Mee. Alsolutely striking. Love the matching envelope. Thanks for joining the Cheery Lynn Designs challenge. Best of luck to you. I saw your card on Cheery Lynn. It;s beautiful. Such a stunning creation. So different & striking. Thanks for joining us for our 'April Showers bring May Flowers' challenge #24. Beautiful! Those blossoms look fantastic! Thanks for joining along with the Simon Says Stamp Monday challenge!